Can you confirm these amateur observations of Mesalina kuri? Diagnosis Diagnosis: A large-bodied Mesalina, with the tail longer than twice the snout-vent length; unkeeled scales on top of the tibia; five or more slightly pigmented scales of equal size in the palpebral disk of the eyelid; a dorsal colour pattern lacking continuous dark lines, with 44-52 dorsal scale rows. Diagnosis. 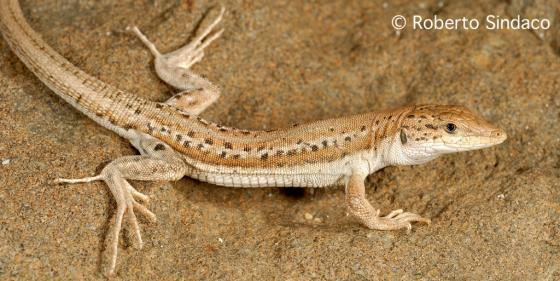 A large-bodied Mesalina, with tail longer than twice snout-vent length; unkeeled scales on top of tibia; five or more slightly pigmented scales of equal size in palpebral disk of eyelid; a dorsal color pattern lacking continuous dark lines, with 44 – 52 dorsal scales rows. Seven lower and 8 upper labials on both sides. Number of transverse ventral scale rows 27 (counted from collar to groin); 46 dorsal scale rows around midbody; 16 scales under fourth finger, and 24 scales under fourth toe. Scales above eye: 2 large central and 2 medium-sized outer su- praocular, accompanied distally by a row of smaller scales composed of 12 scales on the left and 9 scales on the right. Frontonasal scale in contact with rostral; parie- tals in contact with each other, although a large inter- parietal and a small triangular occipital scale are present. Femoral pores number 16 on each side. Dorsal surface of head light brown; some black spots on the interparietal and parietals; lateral margins of parietals blackish. Sides of head whitish, with two dark lateral streaks, one from eye to upper ear opening and other from fifth supralabial to anterior ear opening. Dorsal color light grayish brown medially, with an alternating pattern of a row of small white spots, a row of small blackish spots, a thin white line, and a thin row of black streaks interrupted by small white spots from the vertebral area to the lateral fold. Venter and undersides of head and tail uniform whitish. Tail grey above, with a thin black vertebral line and a lat- eral row of black spots. Hind legs with ocellae-like white-centered spots; foreleg more or less uniform gray (Joger and Mayer, 2002, Yousefkhani et al. 2015).